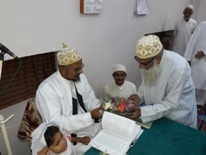 By the Razaa and Farmaan of Maulaanal Mannaan Da’i ul Inse wal Jaan, Saiyedna Haatim Zakiyuddin saheb (tus), on the completion of 9 years of Dars e Nooraani which was held in the sahen of Nooraani Masjid was shifted in a new place in Fakhri Mohalla. 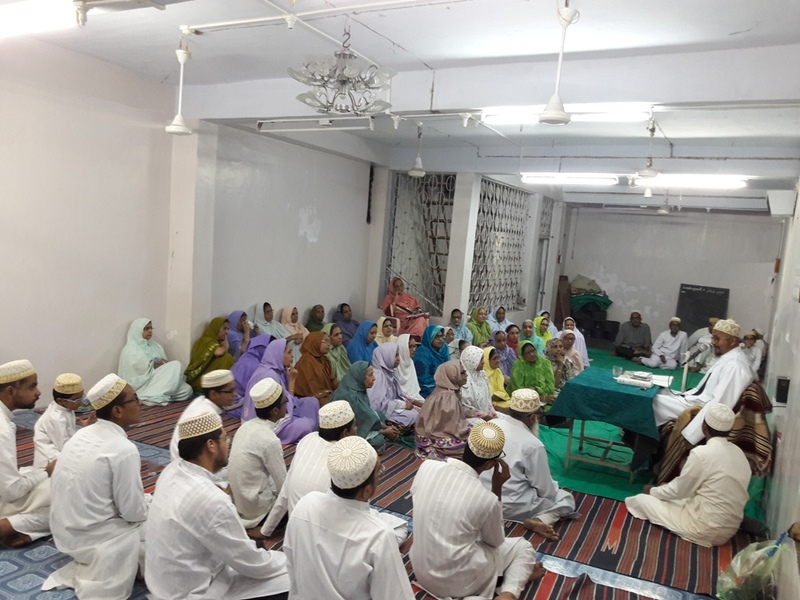 This is the beginning of the 10th year and Mukaasir Maulaa Saiyedi Mohammad Nuruddin saheb (dm) who is conducting this Dars has now named it “Dars e Haatemi”. 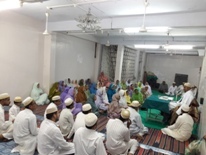 This Dars of ‘Ilm o Hikmat, Ta’weel o Hidaayat, Pand o Naseehat is held in Fakhri Masjid and 8th Safar ul Muzaffar 1438/8-11-2016, Tuesday was its first day in which mumineen and muminaat of every family were present to take the Fayz of ‘Uloom e Ahl ul Bayt (as). Mukaasir Maulaa first gave the detailed outline and proceedings of the Dars. The Ruhaani mahool and enchanting atmosphere of the Dars rejuvenated every Nasf-o-Jaan which the prime aim of Taraqqi and ascension in every fraction of life. 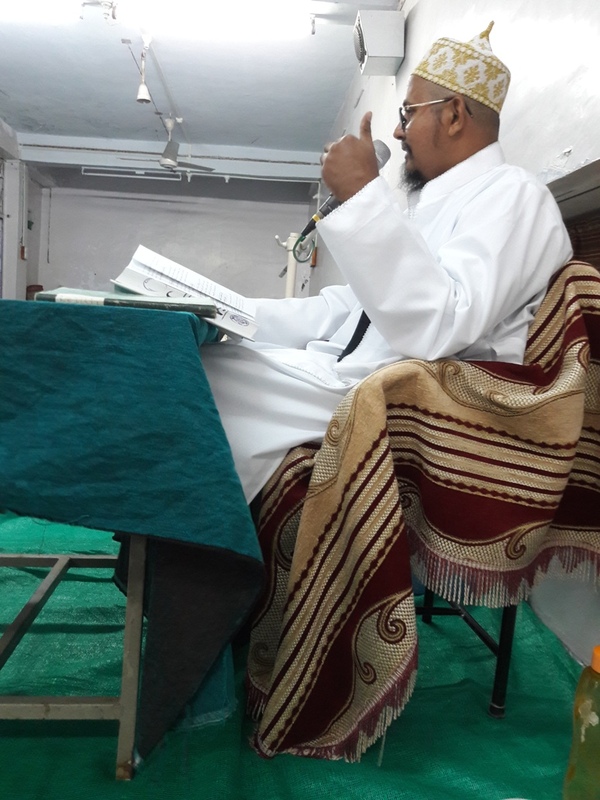 Maulaa remainded the Shahaadat of Mawlaai Musanji bin S Taaj saheb (ra) and his fidaa-giri for the cause of Da’wat in the khidmat of Saiyedna B Dawoodji bin S Ajabshah (aq). He also did Zikr of 32nd Da’i e Mutlaq Saiyedna Ziyauddin saheb (aq) who migrated to Vadodara and built a beautiful mosque in which Dars e Nooraani was initially held. Maulaa recited the Bayt on the Merits of Acquiring Knowledge composed by 41st Da’i e Mutlaq Saiyedna Fakhruddin saheb (aq), “Khazaano ‘Ilm no Mushkil-Kushaa ni ‘Itrat che, Talab je ihnu ‘Ilm karse tehne Jannat che.” Also recited the Bayt composed by Taiyebi Shaa’er during the time of 42nd Da’i e Mutlaq Saiyedna Badruddin saheb (aq), “Dar par aakar tere basad Ta’zeem, Yaa Saiyedna ‘Ali Shaheeh Kareem, Rawz-o-Shabb karte hai Malak Tasleem, Yaa Saiyedna 'Ali Shaheed Kareem.” All those present too recited these abyaat with Maulaa.